“Oh, the story behind the motif is too complicated and sad to express it in a few words. So I’ll say briefly and definitely: ‘Cheerful no, emotional yes’.” The young woman nodded as if understanding instantly, smiling as though satisfied with my answer. I would have told her the circumstances at the time, if she had asked. 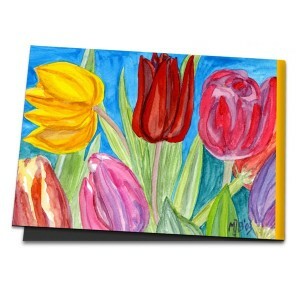 I still remember how I sat in our living room on a beautiful spring day with my colourful tulips. With a wide open window and the sun shining on the table, I painted whilst the TV was on. It was March 2003 and the third Gulf War was being reported live. As a TV viewer you could follow the bombs hitting the ground from the perspective of American aircraft pilots. Their goal were Iraqi tanks, which had been buried by the desert, but were still visible from above as a light brown hill. As in video games, the bombs exploded with intensive colour and a bright but inaudible bang. Here and there and there. With each explosion perhaps five to ten lives were extinguished. I thought about the men, their parents, siblings, women, and children. And while this happened, I painted these beautiful tulips, messengers of spring, of course, innocent, colourful, and asked myself about the reasons for this war. Why are there wars at all, why do people destroy other people, why do things happen that no normal person would wish, why am I so helpless, why am I painting right now…? Yes, it is beautiful to paint nature, to represent things as they are. I am glad that I can mostly find the inner peace to devote myself to reality. With this picture, however, reality has thrown me off course. Nature does not approach the brutality of reality. And so the powerful colours do not express happy feelings, but strong emotions. They broke out of me, quite intuitively, and left a mark on this painting of tulips.